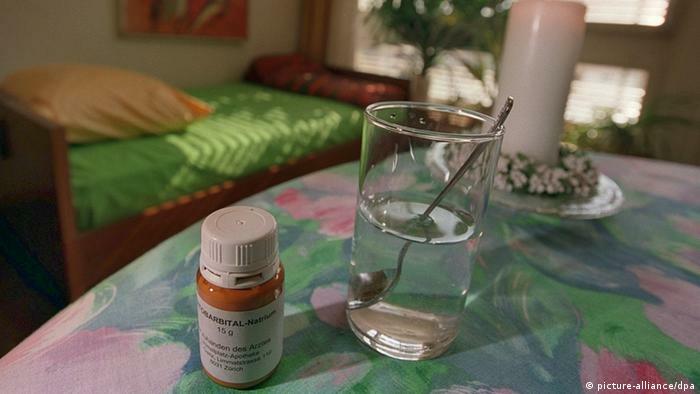 Germany's lower house of parliament has opened a debate on assisted suicide. Chancellor Angela Merkel's government opposes legalizing the practice outright. The lower house Bundestag was scheduled to discuss the issue of assisted suicide for more than four hours in what is known in German parliamentary procedure as a "Thursday debate," in which lawmakers debate an issue a matter of principle. The five parties represented in the Bundestag submitted position papers on the issue in advance of Thursday's session of parliament. A major bone of contention is whether organizations should be allowed to offer assisted suicide services. The three parties that make up Chancellor Angela Merkel's grand coalition government, her Christian Democrats (CDU), the Christian Social Union, and the Social Democrats, reject this idea outright, as do most members of the opposition Greens and the Left party. However, there is a group of parliamentarians from the Greens and the Left who have expressed openness to assisted-suicide organizations. Prior to Thursday's debate, there appeared to be broad agreement on the need to improve palliative care. The leader of the parliamentary party of the Greens, Katrin Göring-Eckhardt told the EPD news agency that an improvement in palliative care was needed in order to give terminally ill patients the confidence that they will be able to die in dignity. "In the absence of this, we shouldn't even be examining the idea of assisted suicide," Göring-Eckhardt said. She also rejected the idea of sanctioning organizations to get involved in assisted suicide in Germany, while at the same time warning against making any future legislation too restrictive, saying there were borderline cases that couldn't be regulated through legislations. "This involves the close relationship between relatives, but also between a doctor and his patient," she said. Health Minister Hermann Gröhe of the CDU, however, warned against passing legislation that wasn't clear. "We would be making a mistake if we thought we could open the door a crack," he said, while also warning that this could lead to the possibility of assisted suicide eventually being regarded as an acceptable form of therapy. No proposed legislation was up for debate in Thursday's session of parliament. The government hopes to have a bill drawn up by early next year.